I am following the Shapes tutorial using JetBrains MPS 3.2 EAP (build #MPS-139.987 from 11th December 2014) and I am getting Error: Property constraint violation for property "propertyId" when adding the Property Macros. As the second screenshot shows, the generated code seems all right, even though the generator fails to compile. What is the cause of this issue? Also, how could I get a more descriptive message? Edit: After some more tests, I get this issue whenever I try to add a Property Macro. 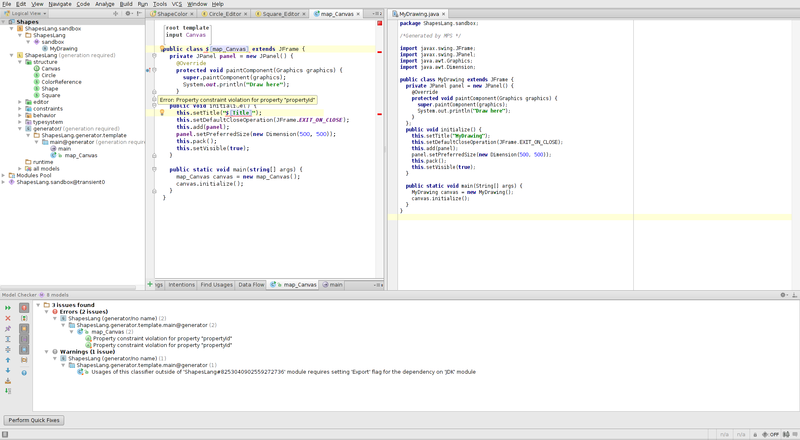 The same steps work without a hitch with JetBrains MPS 3.1 (build #MPS-135.1462 from 14th October 2014), though. In 3.2, projects converted from 3.1 seem to work, too. This was one of the glitches in EAP2, if I remember correctly. I assume it does not prevent you from building and using your language, does it? I'm seeing the same Issue in EAP3 (139.987). If you choose to ignore the error, it indeed does not prevent you from building and using the language. I no longer see the problem when using our master/HEAD of MPS 3.2, so it should go away as soon as you upgrade to rc1. I would like to do so, but the "check for updates" command in MPS says it's the latest version and on the EAP page there is no RC1 for download (https://confluence.jetbrains.com/display/MPS/JetBrains+MPS+EAP+Download+Page). Am I missing something here or is the RC1 simply not yet released? Sorry for puzzling you - rc1 still needs about a week to get ready. Sorry for the delay, I have been busy on other tasks. Indeed, that bug does not prevent me from building and using the language. I initially thought so, but there was an other build error due to some mistake on my behalf lurking behind.